It’s a few days after Christmas and my house has a few more electronic devices. My kids each received tablets from their grandmother. This is great but it poses a bit of a problem…charging on the go. 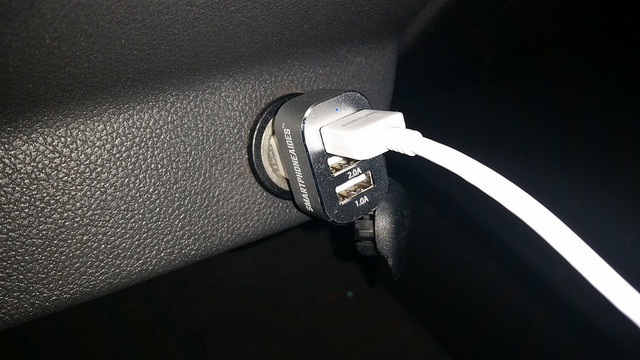 I have only one outlet in my car for a car charger. When you look at three tablets, my phone, and my wife’s phone then you have too many devices on any type of trip. This brings me to my review today. I’m looking at the Smartphoneaides 3 Port USB Car Charger. There are tons of car chargers out there and there are lots of cheap USB car chargers. So is the Smartphoneaides charger different from these? We’ll see. I was given a free charger in order to review this product. That is my disclosure and I assure you my opinions are all my own. 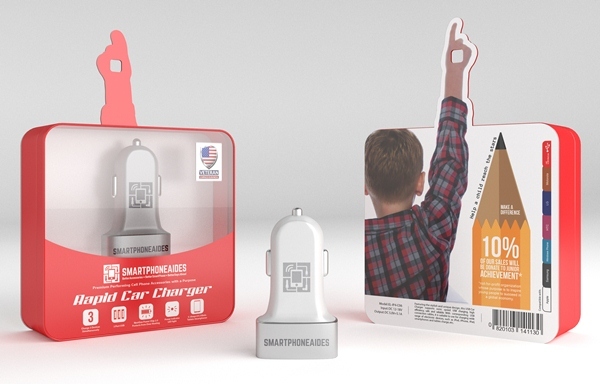 The first thing I noticed about the USB car charger from Smartphoneaides is the packaging is very snazzy (that’s a technical term). Before I go into the specifics of the packaging, I need to explain the company. Smartphoneaides is a female owned company consisting of United States Veterans. This makes me like them right away..but it gets better. The focus of this company is not just profit but impact. They want to have a positive impact and they do this by donating at least 10% of their proceeds to support organizations like Junior Achievement and Wounded Warrior. The packaging is really cool as it has the hang tag as a young boy extending his hand upward. The device itself is also very sleek looking. It features a white and silver color scheme which looks great. I unpacked the device and plugged it into my car outlet. The first thing I noticed was that it was a snug fit. This was great because I didn’t have to adjust it (which means wiggle it around) like I do my other car charger. Next I grabbed the cable for my Samsung Galaxy S5 and plugged it into the 2.1a port. My phone charged with no problems at all. Here’s an important point, I had 2 devices plugged in at one time for a couple of hours and I noticed that the charger never got hot. This is one area where it separates itself from the cheap units you see at the gas stations. 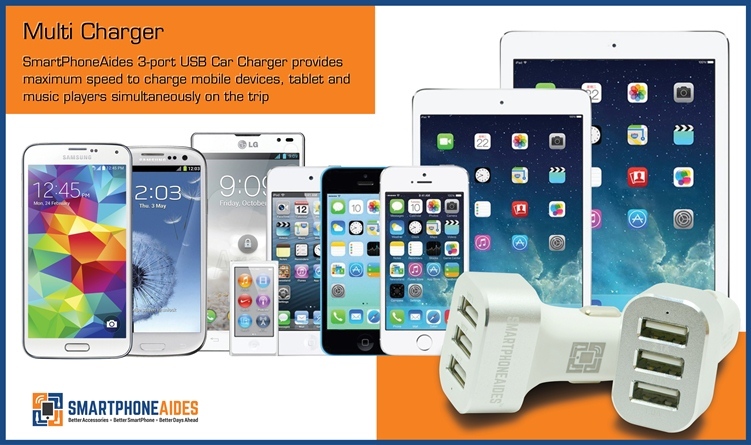 The Smartphoneaides device features Nextgen Power Chip 2.0 technology to prevent overcharging. This saves your device as well as extends the life of the charger. I’ve always wondered why someone would trust their $600 device with a cheap $5 charger. Even better, Smartphoneaides has a great guarantee for the LIFE OF THE PRODUCT. If you feel like you haven’t received value for any reason they will refund 100% of the purchase price. VEHICLE PROTECTION – High output charger will not damage your vehicle’s circuit breakers or cigarette holder. It will not begin to smoke after plugged in for an hour. Utilizing “wings” technology to actually fit in the cigarette holder like other higher end products. This charger will not get hot because of the high grade anti-oxidized aluminum and premium fireproof material. UNMATCHED VERSATILITY – No more “I changed phones and now I have to buy a new charger” dilemma. Certified to meet Apple performance standards. However these USB ports don’t just stop there. You will be simultaneously charging all sorts of devices with ease. Works with Apple iPhone 6/5/5s/4/4s; iPad 5/Air/Mini; Nexus 4; HTC; LG; MP3/MP4 Player; iPod-Touch 4th Gen; Samsung Galaxy Note S5/S4/S3/Tab 2.0; Motorola; Blu-eCigarette; GoPro Device; Handheld Gaming Devices like your kids Nintendo 3DXL or Sony PlayStation. Labeled nicely so you know which port works best with your device. Perfect for day to day use or long family trips! GUARANTEE- Our 100% ‘Better Than Your Money Back’ guarantee will give you peace of mind so that you never having to buy a new charger again.. No questions, catches, or requirements. It’s rare that you get a product that does what is says and does it well. I think that the 3 port USB Rapid Charger from Smartphoneaides hits the mark. I tried it out for several days and I have no negatives on this device. The fact that the company is Veteran owned and donates a portion of it’s proceeds to worthwhile causes is icing on the cake. If you don’t win the contest below then you can get yours from Amazon at a special 50% off price of $19.95. Pick it up here. We’re giving away a charger for you to have of your very own. Just enter below. Looks neat- we have a ton of devices, we could definitely use this on our family vacations. 2 smartphones and 2 laptops. I always have my cell phone and many times also have my tablet and tablet games for my boys. Well we have an iPad, 2 tablets, 2 iPhones, and an iPod touch not to mention the kid’s innotab, leapster explorer, and other games of the sort… so at least 6. =) Thanks for the giveaway! I travel with my tablet, my phone, and he takes his phone and kindle. I usually travel with my cell phone at all times, and sometimes my tablet. I tend to travel with a cellphone, tablet, and sometimes my kindle. We are going to need this in our car soon. One of our cars has two outlets and three in the other one. I have single ports but I have a feeling that we are going to need this three port charger very soon. I usually travel with one device. I travel with my phone every day. When going on vacations, I take my phone, laptop and tablet. When we travel it’s all four of our cell phones plus 2 laptops and a tablet. This charger would be great for us. I usually travel with about 3 devices. I travel with 4 devices; 3 phones and a tablet. Usually 3: my phone, ipod, and tablet! When we travel as a family there is usually 4 devices. We travel with a kindle,computer, my husband and I have a cell phone and 4 of the kids do. 2 of the kids have i-pods. We travel with a lot of things that need charged and could really use this. I usually travel with a smartphone, ipad, and laptop. Our family of six tpically travel with a minimum of four devices but on long treks we usually each have a device or two. We travel with 3 devices, 2 phones and a tablet.